Honolulu Rail Transit will be one part Vancouver SkyTrain — it will use the same driverless cars, allowing for greater frequency at lower cost, and tracks will be elevated — and one part BART. The south shore of O’ahu is a narrow urbanized corridor, so a single line makes sense, and ridership will no doubt be high. 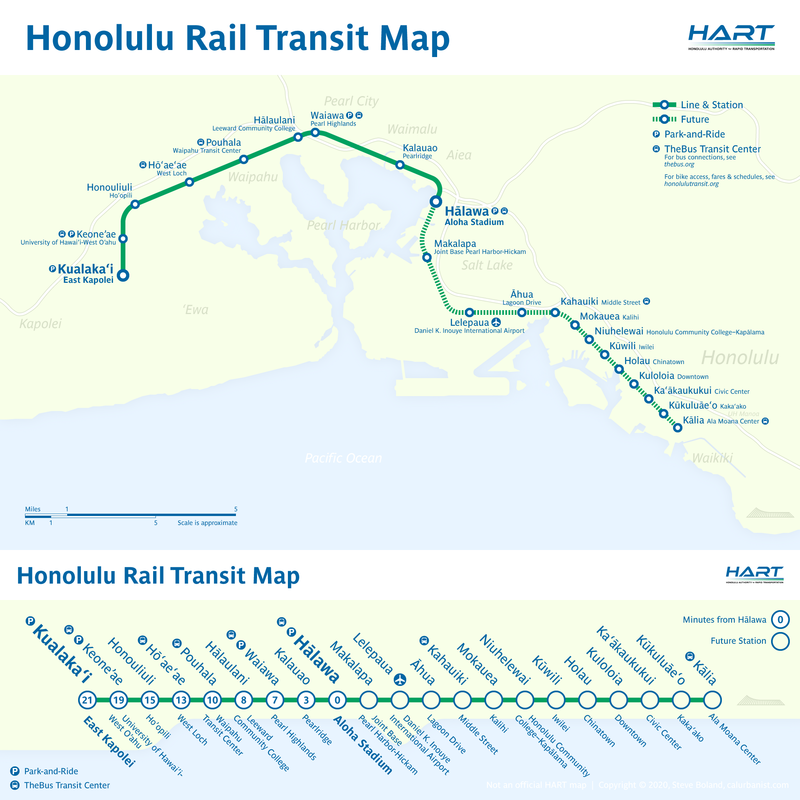 By extending deep into the ‘Ewa suburbs and ending just short of the highrises of Waikiki and the University of Hawaii, however, the initial segment will repeat BART’s mistake by failing to serve urban neighborhoods while providing service to low-density suburbs. It is essential that the project’s eastern extensions proceed as soon as possible. The background is green because, well, O’ahu is a lush, green tropical island (operator HART’s official colors are also green and blue). The typeface is Helvetica Neue because rail transit is new to Hawai’i, and no font says “rail” (to Americans at least) like the official typeface of the New York City Subway.